Chiropodist - Two Cedars has a visiting chiropodist who attends residents every 6 weeks. Our chiropodist is highly skilled and gives practical advice regarding foot care and appropriate footwear. Residents are welcome to employ their own chiropodist if they prefer. Payment for chiropody visits are placed on the monthly sundries bill. Hairdresser - Two Cedars employs a hairdresser who visits every Monday. The hairdresser will also attend residents at other convenient times when necessary. The hairdresser is highly skilled and provides professional, courteous service in the comfort of the home. Payment for hairdressing services are also invoiced on the monthly sundries bill. Dentist - Residents are welcome to use a dentist of their choice. However, we have found that the surgery in York Road is the most accessible locally. Appointments can be made by telephone. Library - A mobile library service is provided to the home every 3 weeks by Broadstone library. Books, audio tapes and CD's are provided and residents are able to choose from a wide range of titles. Newsagent - Local newsagents provide a daily service delivering newspapers and magazines as requested by residents. Newsagents invoice residents directly on a monthly basis. Spiritual Requirements - The local Church of England vicar attends Two Cedars on a monthly basis to provide Holy Communion or celebrate important dates in the religious calendar. Residents from other denominations will be assisted to attend the church or place of prayer of their choice. Transport/Taxis - Residents who require transport and are wheelchair users can access a wheelchair taxi service privately. The telephone number is available from the office. Accompanied trips - Residents are welcome to attend organised shopping trips with members of staff and trips to garden centres or shopping centres can be arranged accordingly. Personal assistance - Two Cedars provides highly trained staff who are willing to provide assistance with personal care needs and day to day activities of daily living. All necessary equipment is provided. Communal areas - Two Cedars has a spacious lounge which is the meeting place for morning coffee, afternoon tea and the varied and interesting activities and entertainment program which is advertised on the residents' notice board which is situated in the hallway outside the lounge. Residents' meetings are also held in the lounge to discuss topics of interest and decisions which are of interest to residents. 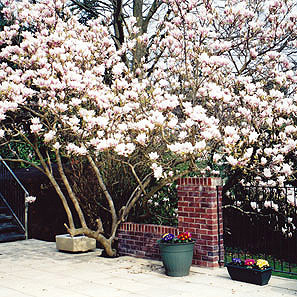 The lounge is for use of both residents and their visitors and patio doors open onto a substantial patio area which is enhanced by a mature magnolia tree. During the summer months the patio is used for residents' enjoyment and to provide access to the half acre of mature gardens, flower beds and lily pond. A lift provides access from the ground floor to the first floor and residents can be accompanied by staff when using the lift if they so wish.